A tetanus shot is a vaccine used to combat bacteria called Clostridium tetani. Almost everyone has been vaccinated as a child, however the vaccine needs to be repeated at regular intervals throughout our life. Tetanus or lockjaw is a serious medical condition, characterized by convulsions and contractions of skeletal muscles. It occurs after Clostridium tetani enters the body through deep wounds, cuts or punctures. These anaerobic bacteria require environment with no oxygen and usually thrive in dirt, debris and animal feces. The treatment usually consists of antibiotics and immunoglobulin. In order to prevent this condition, one must be regularly vaccinated. Fortunately, even those who skipped a vaccine can save themselves from tetanus through post-exposure prophylaxis. This means that everyone who got a deep puncture wound and those whose wounds are suspected to be contaminated can get vaccinated and prevent the bacterial infection. According to current medical standards, it is recommended that a child get five shots during their childhood. 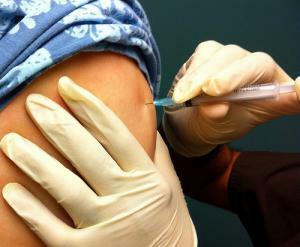 The shot is usually a combination of tetanus, acellular pertussis and diphtheria vaccines. The first is given when the child is two months old, the second at four months, the third at six months, the fourth anywhere between 15 and 18 months and the fifth between ages 4 and 6. As for the adults, it is generally advised to take one tetanus shot every 10 years. That type of vaccine is a booster and is called Tdap vaccine. People who cannot remember having tetanus shots as children usually receive Tdap in a series of three. As tetanus vaccine weakens over time, it is best to have boosters on a regular basis. Elderly people should get tetanus and diphteria shots every 10 years as well. It is important to get tetanus shots after injuries, especially if they are caused by rusty metal objects. The vaccine should be given within 48 hours after the injury. Most medical experts recommend these post-exposure shots even for people who are regularly vaccinated. These shots are 100% effective against bacteria. However, a tetanus shot should not be given to a person who is ill or still not fully recovered. In addition, some people are allergic to one or more components of the tetanus shot, and they should not receive it, otherwise they may get a severe allergic reaction or anaphylaxis. As for the side effects of this vaccine, they are usually mild and consist of redness or swelling where the vaccine was given. There may also be some nausea and headache, low grade fever and fatigue. More severe side effects include vomiting, diarrhea, high fever, seizures, coma and brain damage. What shots do dogs need and what is the best time for vaccination?